For other uses, see Israeli settlement (disambiguation). CIA remote sensing map of Greater Jerusalem, showing Israeli settlements, Palestinian refugee camps, fences, walls, etc. in May 2006. Map of the Golan Heights with Israeli settlements in 1992. Israeli settlements are Jewish Israeli civilian communities[i] built on lands occupied by Israel since the 1967 Six-Day War. Such settlements currently exist in the West Bank, East Jerusalem, and in the Golan Heights. Settlements previously existed in the Sinai Peninsula and Gaza Strip until Israel evacuated the Sinai settlements following the 1979 Israel-Egypt peace agreement and from the Gaza Strip in 2005 under Israel's unilateral disengagement plan. Israel dismantled 18 settlements in the Sinai Peninsula in 1982, and all 21 in the Gaza Strip and 4 in the West Bank in 2005, but continues to both expand its settlements and settle new areas in the West Bank, despite pressure to desist from the international community. According to the Israeli investigative reporter Uri Blau, settlements are massively funded by private tax-exempt U.S. NGOs, to the tune of $220 million for 2009-2013 alone, suggesting that the U.S. is indirectly subsidizing their creation. The international community considers the settlements in occupied territory to be illegal, and the United Nations has repeatedly upheld the view that Israel's construction of settlements constitutes a violation of the Fourth Geneva Convention. Israeli neighborhoods in East Jerusalem and communities in the Golan Heights, the latter of which has been annexed by Israel, are also considered settlements by the international community, which does not recognise Israel's annexations of these territories. The International Court of Justice also says these settlements are illegal in a 2004 advisory opinion. In April 2012, UN secretary general Ban Ki-Moon, in response to moves by Israel to legalise Israeli outposts, reiterated that all settlement activity is illegal, and "runs contrary to Israel's obligations under the Road Map and repeated Quartet calls for the parties to refrain from provocations." Similar criticism was advanced by the EU and the US. Israel disputes the position of the international community and the legal arguments that were used to declare the settlements illegal. The presence and ongoing expansion of existing settlements by Israel and the construction of settlement outposts is frequently criticized as an obstacle to the peace process by the Palestinians, and third parties such as the OIC, the United Nations, Russia, the United Kingdom, France, the European Union, and the United States have echoed those criticisms. Settlement has an economic dimension, much of it driven by the significantly lower costs of housing in Jewish settlements compared to the cost of housing and living in Israel. Government spending per citizen in the Jewish settlements is double that spent per Israeli citizen in Tel Aviv and Jerusalem, while government spending for settlers in isolated areas is three times the Israeli national average. Most of the spending goes to the security of the citizens living there. On 30 June 2014, according to the Yesha Council, 382,031 Jewish settlers lived in the 121 officially recognised settlements in the West Bank, over 300,000 Israelis lived in settlements in East Jerusalem and over 20,000 lived in settlements in the Golan Heights. In January 2015 the Israeli Interior Ministry gave figures of 389,250 Israelis living in the West Bank and a further 375,000 Israelis living in East Jerusalem. Settlements range in character from farming communities and frontier villages to urban suburbs and neighborhoods. 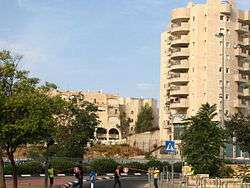 The four largest settlements, Modi'in Illit, Ma'ale Adumim, Beitar Illit and Ariel, have achieved city status. Ariel has 18,000 residents, while the rest have around 37,000 to 55,500 each. A number of Palestinians reside in settlements in East Jerusalem. (from Jordan) the entire West Bank of the Jordan River, including parts of Jerusalem (East Jerusalem). (from Egypt) the entire Sinai Peninsula up to the Suez Canal, and the Gaza strip. 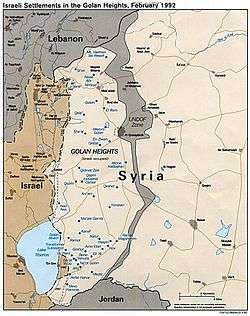 (from Syria) most of the Golan Heights, since 1981, administered under the Golan Heights Law. As early as 1967, Israeli settlement policy was started by the Labor government of Levi Eshkol. The basis for Israeli settlement in the West Bank became the Allon Plan, named after its inventor Yigal Allon. It implied Israeli annexation of major parts of the Israeli-occupied territories, especially East Jerusalem, Gush Etzion and the Jordan Valley. The settlement policy of the government of Yitzhak Rabin, was also derived from the Allon Plan. The first settlement was Kfar Etzion, in the southern West Bank, although that location was outside the Allon Plan. Many settlements began as Nahal settlements. They were established as military outposts and later expanded and populated with civilian inhabitants. According to a secret document dating to 1970, obtained by Haaretz, the settlement of Kiryat Arba was established by confiscating land by military order and falsely representing the project as being strictly for military use while in reality, Kiryat Arba was planned for settler use. The method of confiscating land by military order for establishing civilian settlements was an open secret in Israel throughout the 1970s, but publication of the information was suppressed by the military censor. Since 1967, government-funded settlement projects in the West Bank are implemented by the "Settlement Division" of the World Zionist Organization. Though formally a non-governmental organization, it is funded by the Israeli government and leases lands from the Civil Administration to settle in the West Bank. It is authorized to create settlements in the West Bank on lands licensed to it by the Civil Administration. Traditionally, the Settlement Division has been under the responsibility of the Agriculture Ministry. Since the Olso Accords, it was always housed within the Prime Minister's Office (PMO). In 2007, it was moved back to the Agriculture Ministry. In 2009, the Netanyahu Government decided to subject all settlement activities to additional approval of the Prime Minister and the Defense Minister. In 2011, Netanyahu sought to move the Settlement Division again under the direct control of (his own) PMO, and to curtail Defense Minister Ehud Barak's authority. At the presentation of the Oslo II Accord on 5 October 1995 in the Knesset, PM Yitzhak Rabin expounded the Israeli settlement policy in connection with the permanent solution to the conflict. Israel wanted "a Palestinian entity, less than a state, which will be a home to most of the Palestinian residents living in the Gaza Strip and the West Bank". It wanted to keep settlements beyond the Green Line including Ma'ale Adumim and Givat Ze'ev in East Jerusalem. Blocs of settlements should be established in the West Bank. Rabin promised not to return to the 4 June 1967 lines. In June 1997, the Likud government of Benjamin Netanyahu presented its "Allon Plus Plan". This plan holds the retention of some 60% of the West Bank, including the "Greater Jerusalem" area with the settlements Gush Etzion and Ma'aleh Adumim, other large concentrations of settlements in the West Bank, the entire Jordan Valley, a "security area", and a network of Israeli-only bypass roads. In the Road map for peace of 2002, which was never implemented, the establishment of a Palestinian state was acknowledged. Outposts would be dismantled. However, many new outposts appeared instead, few were removed. Israel's settlement policy remained unchanged. Settlements in East Jerusalem and remaining West Bank were expanded. While according to official Israeli policy no new settlements were built, at least some hundred unauthorized outposts were established since 2002 with state funding in the 60% of the West Bank that was not under Palestinian administrative control and the population growth of settlers did not diminish. In 2005, all 21 settlements in the Gaza Strip and four in the northern West Bank were forcibly evacuated as part of Israeli disengagement from the Gaza Strip, known to some in Israel as "the Expulsion". However, the disengagement was more than compensated by transfers to the West Bank. After the failure of the Roadmap, several new plans emerged to settle in major parts of the West Bank. 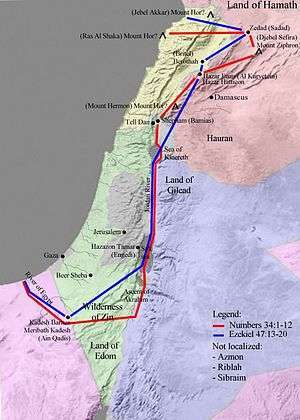 In 2011, Haaretz revealed the Civil Administration's "Blue Line"-plan, written in January 2011, which aims to increase Israeli "state-ownership" of West Bank lands ("state lands") and settlement in strategic areas like the Jordan Valley and the Palestinian northern Dead Sea area. In March 2012, it was revealed that the Civil Administration over the years covertly allotted 10% of the West Bank for further settlement. Provisional names for future new settlements or settlement expansions were already assigned. The plan includes many Palestinian built-up sites in the Areas A and B.
Jews who had been living in the West Bank before they were expelled in 1948 wanted to return home. After the Six-Day War, some Israelis believed that war might break out again. They built settlements on hilltops to act as observation posts for an early warning system. Israelis were afraid that if strategically important lands were returned, Israelis would be in danger. For years, Syria had been firing from the Golan Heights into the kibbutzim of the valley. If Syria got back the Golan Heights, they would resume firing on the Israelis below. Israelis remembered that after conquering the Sinai, Israel withdrew from the Sinai. If Israel constructed a military base, the soldiers could be ordered to leave, but if they created a "settlement on the Syrian heights – a civilian presence, then no one could just order a withdrawal. There'd have to be a debate in the Knesset." There were Israelis who remembered that Israel had conquered the Sinai in 1956, but gave it back. "…the promises made by Eisenhower had proved hollow at the first test and had failed to prevent war…" They were willing to return land, but only if Israel got a peace treaty in return. They were hoping that building settlements would make it more difficult for Israel to withdraw from land without getting a peace treaty in return. There were "Religious radicals, convinced that they were fulfilling God's plan for history…" For Avraham Kook, "the Jews' role was to be the vessel that brings the "divine idea" into the world. The world's redemption depended on the Jews living in the Land of Israel" Rabbi Tzvi Kook said…It's "the Lord's land. Is it in our hands to give up even a millimeter?" The State of Israel represented the "beginning of redemption" and was "the state that the prophets foresaw" when they spoke of the End of Days. "…the Bible was the Jewish deed to the Land of Israel…" "…the conquest as introducing the end of days, when 'nation shall not lift up sword against nation.'" There were secular Israelis who saw "the West Bank as the historic patrimony of the Jewish people and control of this region as a matter of momentous historic importance." Settlement building as punishment. "According to reports on Israel Radio, the development is a response to the 2014 kidnapping and murder of Israeli teenagers." Settlements as bargaining chips for negotiations. Some settlements are self-contained cities with a stable population in the tens of thousands, infrastructure, and all other features of permanence. Examples are Beitar Illit (a city of close to 45,000 residents), Ma'ale Adumim, Modi'in Illit, and Ariel (almost 20,000 residents). Some are towns with a local council status with populations of 2,000–20,0000, such as Alfei Menashe, Eli, Elkana, Efrat and Kiryat Arba. There are also clusters of villages governed by a local elected committee and regional councils that are responsible for municipal services. Examples are Kfar Adumim, Neve Daniel, Kfar Tapuach and Ateret. Kibbutzim and moshavim in the territories include Argaman, Gilgal, Niran and Yitav. Jewish neighborhoods have been built on the outskirts of Arab neighborhoods, for example in Hebron. In Jerusalem, there are urban neighborhoods where Jews and Arabs live together: the Muslim Quarter, Silwan, Abu Tor, Sheikh Jarrah and Shimon HaTzadik. Under the Oslo Accords, the West Bank was divided into three separate parts designated as Area A, Area B and Area C. Leaving aside the position of East Jerusalem, all of the settlements are in Area C which comprises about 60% of the West Bank. Cities/towns: Ariel, Betar Illit, Modi'in Illit and Ma'ale Adumim. Urban suburbs, such as Har Gilo. 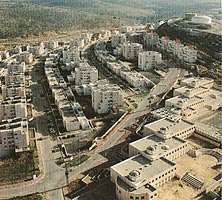 Block settlements, such as Gush Etzion and settlements in the Nablus area. Frontier villages, such as those along the Jordan River. Outposts, small settlements, some authorized and some unauthorized, often on hilltops. The Sasson Report, commissioned by Ariel Sharon's administration, found that several government ministries had cooperated to establish illegal outposts, spending millions of dollars on infrastructure. Some settlements were established on sites where Jewish communities had existed during the British Mandate of Palestine. Jerusalem—Jewish presence alongside other peoples since biblical times, various surrounding communities and neighborhoods, including Kfar Shiloah, also known as Silwan—settled by Yemenite Jews in 1884, Jewish residents evacuated in 1938, a few Jewish families move into reclaimed homes in 2004. Other communities: Shimon HaTzadik, Neve Yaakov and Atarot which in post-1967 was rebuilt as an industrial zone. Gush Etzion—four communities, established between 1927 and 1947, destroyed 1948, reestablished beginning 1967. Hebron—Jewish presence since biblical times, forced out in the wake of the 1929 Hebron massacre, some families returned in 1931 but were evacuated by the British, a few buildings resettled in 1967. Kfar Darom—established in 1946, evacuated in 1948, resettled in 1970, evacuated in 2005 as part of the withdrawal from the Gaza Strip. 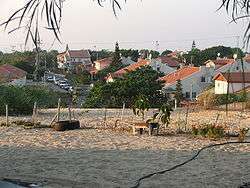 Kalia and Beit HaArava—the former was built in 1934 as a kibbutz for potash mining. The latter was built in 1943 as an agricultural community. Both were abandoned in 1948, and subsequently destroyed by Jordanian forces, and resettled after the Six-Day War. Gaza City had a Jewish community for many centuries that was evacuated following riots in 1929. After the Six-Day War, Jewish communities were built elsewhere in the Gaza Strip, but not in Gaza City proper. At the end of 2010, 534,224 Jewish Israeli lived in the West Bank, including East Jerusalem. 314,132 of them lived in the 121 authorised settlements and 102 unauthorised settlement outposts on the West Bank, 198,629 were living in East Jerusalem, and almost 20,000 lived in settlements in the Golan Heights. In 2011, 328,423 Israeli Jews were living on the West Bank, excluding Jerusalem, and the Jewish population in the Golan Heights exceeded 20,000. For the year 2012, the Jewish population in the West Bank settlements excluding East Jerusalem was expected to rise to 350,000. In May 2014, the Israeli Housing Minister Uri Ariel, who himself lives in the West Bank settlement of Kfar Adumim, put the settler population at up to 750,000: 400,000 in the West Bank and up to 350,000 in East Jerusalem. He stated: "I think that in five years there will be 550,000 or 600,000 Jews in Judea and Samaria, rather than 400,000 (now)". Note: due to change of definition, the number of settlements in the West Bank decreased in 1997 from 138 to 121 (outposts not included). In addition to internal migration, in large though declining numbers, the settlements absorb annually about 1000 new immigrants from outside Israel. In the 1990s, the annual settler population growth was more than three times the annual population growth in Israel. Population growth has continued in the 2000s. According to the BBC, the settlements in the West Bank have been growing at a rate of 5–6% since 2001. The establishment of settlements in the Palestinian territories is linked to the displacement of the Palestinian populations as evidenced by a 1979 Security Council Commission which established a link between Israeli settlements and the displacement of the local population. The commission also found that those who remained were under consistent pressure to leave to make room for further settlers who were being encouraged into the area. In conclusion the commission stated that settlement in the Palestinian territories was causing "profound and irreversible changes of a geographic and demographic nature". The Israeli settlements in the West Bank make up what Israel calls the Judea and Samaria Area. Since December 2007, approval by both the Israeli Prime Minister and Israeli Defense Minister of all settlement activities (including planning) in the West Bank is required. Authority for planning and construction is held by the Israel Defense Forces Civil Administration. The area consists of four cities, thirteen local councils and six regional councils. 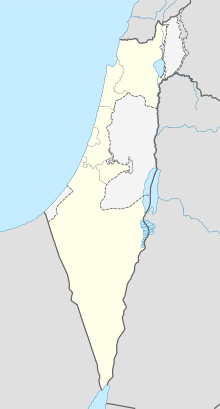 Regional councils: Gush Etzion (Ezion Bloc), Har Hebron (Mount Hebron), Matte Binyamin (Staff of Benjamin, named after the ancient Israelite tribe that dwelled in the area), Megilot (Scrolls, named after the Dead Sea scrolls, which were discovered in the area), Shomron Regional Council (Samaria), Biq'at HaYarden (Jordan valley). The Yesha Council (Hebrew: מועצת יש"ע‎‎, Moatzat Yesha, a Hebrew acronym for Judea, Samaria and Gaza) is the umbrella organization of municipal councils in the West Bank. The actual buildings of the Israeli settlements cover only 1 percent of the West Bank, but their jurisdiction and their regional councils extend to about 42 percent of the West Bank, according to the Israeli NGO B'Tselem. Yesha Council chairman Dani Dayan disputes the figures and claims that the settlements only control 9.2 percent of the West Bank. Between 2001 and 2007 more than 10,000 Israeli settlement units were built, while 91 permits were issued for Palestinian construction, and 1,663 Palestinian structures were demolished in Area C.
West Bank Palestinians have their cases tried in Israel's military courts while Jewish Israeli settlers living in the same occupied territory are tried in civil courts. The arrangement has been described as "de facto segregation" by the UN Committee on the Elimination of Racial Discrimination. A bill to formally extend Israeli law to the Israeli settlements in the West Bank was rejected in 2012. On 31 August 2014, Israel announced it was appropriating 400 hectares of land in the West Bank to eventually house 1,000 Israel families. The appropriation was described as the largest in more than 30 years. According to reports on Israel Radio, the development is a response to the 2014 kidnapping and murder of Israeli teenagers. East Jerusalem is defined in the Jerusalem Law as part of Israel and its capital, Jerusalem. As such it is administered as part of the city and its district, the Jerusalem District. Pre-1967 residents of East Jerusalem and their descendants have residency status in the city but many have refused Israeli citizenship. Thus, the Israeli government maintains an administrative distinction between Israeli citizens and non-citizens in East Jerusalem, but the Jerusalem municipality does not. The Golan Heights is administered under Israeli civil law as the Golan sub-district, a part of the Northern District. Israel makes no legal or administrative distinction between pre-1967 communities in the Golan Heights (mainly Druze) and the post-1967 settlements. After the capture of the Sinai Peninsula from Egypt in the 1967 Six-Day War, settlements were established along the Gulf of Aqaba and in the northeast, just below the Gaza Strip. It had plans to expand the settlement of Yamit into a city with a population of 200,000, though the actual population of Yamit did not exceed 3,000. The Sinai Peninsula was returned to Egypt in stages beginning in 1979 as part of the Egypt–Israel Peace Treaty. As required by the treaty, Israel evacuated the civilian population, which took place in 1982. Some evacuation was done forcefully in some instances, such as the evacuation of Yamit. Before Israel's unilateral disengagement plan in which the Israeli settlements were evacuated, there were 21 settlements in the Gaza Strip under the administration of the Hof Aza Regional Council. The land was allocated in such a way that each Israeli settler disposed of 400 times the land available to the Palestinian refugees, and 20 times the volume of water allowed to the peasant farmers of the Strip. The consensus view in the international community is that the existence of Israeli settlements in the West Bank including East Jerusalem and the Golan Heights is in violation of international law. The Fourth Geneva Convention includes statements such as "the Occupying Power shall not deport or transfer parts of its own civilian population into the territory it occupies". At present, the view of the international community, as reflected in numerous UN resolutions, regards the building and existence of Israeli settlements in the West Bank, East Jerusalem and the Golan Heights as a violation of international law. UN Security Council Resolution 446 refers to the Fourth Geneva Convention as the applicable international legal instrument, and calls upon Israel to desist from transferring its own population into the territories or changing their demographic makeup. The reconvened Conference of the High Contracting Parties to the Geneva Conventions has declared the settlements illegal as has the primary judicial organ of the UN, the International Court of Justice. The position of successive Israeli governments is that all authorized settlements are entirely legal and consistent with international law. In practice, Israel does not accept that the Fourth Geneva Convention applies de jure, but has stated that on humanitarian issues it will govern itself de facto by its provisions, without specifying which these are. The scholar and jurist Eugene Rostow has disputed the illegality of authorized settlements. Under Israeli law, West Bank settlements must meet specific criteria to be legal. In 2009, there were approximately 100 small communities that did not meet these criteria and are referred to as illegal outposts. In 2014 twelve EU countries warned businesses against involving themselves in the settlements. According to the warnings, economic activities relating to the settlements involve legal and economic risks stemming from the fact that the settlements are built on occupied land not recognized as Israel's. "My conclusion is that civilian settlement in the administered territories contravenes the explicit provisions of the Fourth Geneva Convention." This legal opinion was sent to Prime Minister Levi Eshkol. However, it was not made public at the time. The Labor cabinet allowed settlements despite the warning. This paved the way for future settlement growth. In 2007, Meron stated that "I believe that I would have given the same opinion today." In 1978, the Legal Adviser of the Department of State of the United States reached the same conclusion. The International Court of Justice, in its advisory opinion, has since ruled that Israel is in breach of international law by establishing settlements in Occupied Palestinian Territory, including East Jerusalem. The Court maintains that Israel cannot rely on its right of self-defense or necessity to impose a regime that violates international law. The Court also ruled that Israel violates basic human rights by impeding liberty of movement and the inhabitants' right to work, health, education and an adequate standard of living. International intergovernmental organizations such as the Conference of the High Contracting Parties to the Fourth Geneva Convention, major organs of the United Nations, the European Union, and Canada, also regard the settlements as a violation of international law. The Committee on the Elimination of Racial Discrimination wrote that "The status of the settlements was clearly inconsistent with Article 3 of the Convention, which, as noted in the Committee's General Recommendation XIX, prohibited all forms of racial segregation in all countries. There is a consensus among publicists that the prohibition of racial discrimination, irrespective of territories, is an imperative norm of international law." Amnesty International, and Human Rights Watch have also characterized the settlements as a violation of international law. According to Talia Sasson, the High Court of Justice in Israel, with a variety of different justices sitting, has repeatedly stated for more than 4 decades that Israel's presence in the West Bank is in violation of international law. Four prominent jurists cited the concept of the "sovereignty vacuum" in the immediate aftermath of the Six-Day War to describe the legal status of the West Bank and Gaza: Yehuda Zvi Blum in 1968, Elihu Lauterpacht in 1968, Julius Stone in 1969 and 1981, and Stephen M. Schwebel in 1970. Eugene V. Rostow also argued in 1979 that the occupied territories' legal status was undetermined. Stephen M. Schwebel. made three distinctions specific to the Israeli situation to claim that the territories were seized in self-defense and that Israel has more title to them than the previous holders. Professor Julius Stone also wrote that "Israel's presence in all these areas pending negotiation of new borders is entirely lawful, since Israel entered them lawfully in self-defense." He argued that it would be an "irony bordering on the absurd" to read Article 49(6) as meaning that the State of Israel was obliged to ensure (by force if necessary) that areas with a millennial association with Jewish life, shall be forever "judenrein". Professor Ben Saul took exception to this view, arguing that Article 49(6) can be read to include voluntary or assisted transfers, as indeed it was in the advisory opinion of the International Court of Justice which had expressed this interpretation in the Israeli Wall Advisory Opinion (2003). International law has long recognised that there are crimes of such severity they should be considered "international crimes." Such crimes have been established in treaties such as the Genocide Convention and the Geneva Conventions.... The following are Israel's primary issues of concern [ie with the rules of the ICC]: The inclusion of settlement activity as a "war crime" is a cynical attempt to abuse the Court for political ends. The implication that the transfer of civilian population to occupied territories can be classified as a crime equal in gravity to attacks on civilian population centres or mass murder is preposterous and has no basis in international law. A UN conference held in Rome in 1998, where Israel was one of seven countries to vote against the Rome Statute to establish the International Criminal Court. Israel was opposed to a provision that included as a war crime the transfer of civilian populations into territory the government occupies. Israel has signed the statute, but not ratified the treaty. By Israeli law, privately owned land can not be part of a settlement, unless the land in question has been confiscated for military purposes. In 2006 Peace Now acquired a report, which it claims was leaked from the Israeli Government's Civil Administration, indicating that up to 40 percent of the land Israel plans to retain in the West Bank is privately owned by Palestinians. Peace Now called this a violation of Israeli law. Peace Now published a comprehensive report about settlements on private lands. In the wake of a legal battle, Peace Now lowered the figure to 32 percent, which the Civil Administration also denied. The Washington Post reported that "The 38-page report offers what appears to be a comprehensive argument against the Israeli government's contention that it avoids building on private land, drawing on the state's own data to make the case." In February 2008, the Civil Administration stated that the land on which more than a third of West Bank settlements was built had been expropriated by the IDF for "security purposes." The unauthorized seizure of private Palestinian land was defined by the Civil Administration itself as 'theft.' According to B'Tselem, more than 42 percent of the West Bank are under control of the Israeli settlements, 21 percent of which was seized from private Palestinian owners, much of it in violation of the 1979 Israeli Supreme Court decision. In 1979, the government decided to extend settlements or build new ones only on "state lands". A secret database, drafted by a retired senior officer, Baruch Spiegel, on orders from former defense minister Shaul Mofaz, found that some settlements deemed legal by Israel were illegal outposts, and that large portions of Ofra, Elon Moreh and Beit El were built on private Palestinian land. The "Spiegel report" was revealed by Haaretz in 2009. Many settlements are largely built on private lands, without approval of the Israeli Government. According to Israel, the bulk of the land was vacant, was leased from the state, or bought fairly from Palestinian landowners. Invoking the Absentee Property Law to transfer, sell or lease property in East Jerusalem owned by Palestinians who live elsewhere without compensation has been criticized both inside and outside of Israel. Opponents of the settlements claim that "vacant" land belonged to Arabs who fled or collectively to an entire village, a practice that developed under Ottoman rule. B'Tselem charged that Israel is using the absence of modern legal documents for the communal land as a legal basis for expropriating it. These "abandoned lands" are sometimes laundered through a series of fraudulent sales. According to Amira Hass, one of the techniques used by Israel to expropriate Palestinian land is to place desired areas under a 'military firing zone' classification, and then issue orders for the evacuation of Palestinians from the villages in that range, while allowing contiguous Jewish settlements to remain unaffected. Parts of the West Bank allocated to the settlements, as of January 2012 (in pink and purple color). Access is prohibited or restricted to Palestinians. Amnesty International argues that Israel's settlement policy is discriminatory and a violation of Palestinian human rights. B'Tselem claims that Israeli travel restrictions impact on Palestinian freedom of movement and Palestinian human rights have been violated in Hebron due to the presence of the settlers within the city. According to B'Tselem, over fifty percent of West Bank land expropriated from Palestinians has been used to establish settlements and create reserves of land for their future expansion. The seized lands mainly benefit the settlements and Palestinians cannot use them. The roads built by Israel in the West Bank to serve the settlements are closed to Palestinian vehicles' and act as a barrier often between villages and the lands on which they subsist. Human Rights Watch and other human rights observer volunteer regularly file reports on "settler violence," referring to stoning and shooting incidents involving Israeli settlers. Israel's withdrawal from Gaza and Hebron have led to violent settler protests and disputes over land and resources. Meron Benvenisti described the settlement enterprise as a "commercial real estate project that conscripts Zionist rhetoric for profit." The construction of the Israeli West Bank barrier has been criticized as an infringement on Palestinian human and land rights. The United Nations Office for the Coordination of Humanitarian Affairs estimated that 10% of the West Bank would fall on the Israeli side of the barrier. In July 2012, the UN Human Rights Council decided to set up a probe into Jewish settlements. The report of the independent international fact-finding mission which investigated the "implications of the Israeli settlements on the civil, political, economic, social and cultural rights of the Palestinian people throughout the Occupied Palestinian Territory" was published in February 2013. Goods produced in Israeli settlements are able to stay competitive on the global market, in part because of massive state subsidies they receive from the Israeli government. Farmers and producers are given state assistance, while companies that set up in the territories receive tax breaks and direct government subsidies. An Israeli government fund has also been established to help companies pay customs penalties. Palestinian officials estimate that settlers sell goods worth some $500 million to the Palestinian market. Israel has built 16 industrial zones, containing roughly 1000 industrial plants, in the West Bank and East Jerusalem on acreage that consumes large parts of the territory planned for a future Palestinian state. According to Jodi Rudoren these installations both entrench the occupation and provide work for Palestinians, even those opposed to it. The 16 parks are located at Shaked, Beka'ot, Baran, Karnei Shomron, Emmanuel, Barkan, Ariel, Shilo, Halamish, Ma'ale Efraim, Sha'ar Binyamin, Atarot, Mishor Adumim, Gush Etzion, Kiryat Arba and Metarim (2001). According to Israeli government estimates, $230 million worth of settler goods including fruit, vegetables, cosmetics, textiles and toys are exported to the EU each year, accounting for approximately 2% of all Israeli exports to Europe. A 2013 report of Profundo revealed that at least 38 Dutch companies imported settlement products. European Union law requires a distinction to be made between goods originating in Israel and those from the occupied territories. The former benefit from preferential custom treatment according to the EU-Israel Association Agreement (2000); the latter don't, having been explicitly excluded from the agreement. In practice, however, settler goods often avoid mandatory customs through being labelled as originating in Israel, while European customs authorities commonly fail to complete obligatory postal code checks of products to ensure they have not originated in the occupied territories. In 2009, the United Kingdom's Department for the Environment, Food and Rural Affairs issued new guidelines concerning labelling of goods imported from the West Bank. The new guidelines require labelling to clarify whether West Bank products originate from settlements or from the Palestinian economy. Israel's foreign ministry said that the UK was "catering to the demands of those whose ultimate goal is the boycott of Israeli products"; but this was denied by the UK government, who said that the aim of the new regulations was to allow consumers to choose for themselves what produce they buy. Denmark has similar legislation requiring food products from settlements in the occupied territories to be accurately labelled. A Palestinian report argued in 2011 that settlements have a detrimental effect on the Palestinian economy, equivalent to about 85% of the nominal gross domestic product of Palestine, and that the "occupation enterprise" allows the state of Israel and commercial firms to profit from Palestinian natural resources and tourist potential. A 2013 report published by the World Bank analysed the impact that the limited access to Area C lands and resources had on the Palestinian economy. While settlements represent a single axis of control, it is the largest with 68% of the Area C lands reserved for the settlements. The report goes on to calculate that access to the lands and resources of Area C, including the territory in and around settlements, would increase the Palestinian GDP by some $3.5 billion (or 35%) per year. The Israeli Supreme Court has ruled that Israeli companies are entitled to exploit the West Bank's natural resources for economic gain, and that international law must be "adapted" to the "reality on the ground" of long-term occupation. Due to the availability of jobs offering twice the prevailing salary of the West Bank (as of August 2013), as well as high unemployment, tens of thousands of Palestinians work in Israeli settlements. According to the Manufacturers Association of Israel, some 22,000 Palestinians were employed in construction, agriculture, manufacturing and service industries. An Al-Quds University study in 2011 found that 82% of Palestinian workers said they would prefer to not work in Israeli settlements if they had alternative employment in the West Bank. Palestinians have been highly involved in the construction of settlements in the West Bank. In 2013, the Palestinian Central Bureau of Statistics released their survey showing that the number of Palestinian workers who are employed by the Jewish settlements increased from 16,000 to 20,000 in the first quarter. The survey also found that Palestinians who work in Israel and the settlements are paid more than twice their salary compared to what they receive from Palestinian employers. In 2008, Kav LaOved charged that Palestinians who work in Israeli settlements are not granted basic protections of Israeli labor law. Instead, they are employed under Jordanian labor law, which does not require minimum wage, payment for overtime and other social rights. In 2007, the Supreme Court of Israel ruled that Israeli labor law does apply to Palestinians working in West Bank settlements and applying different rules in the same work place constituted discrimination. The ruling allowed Palestinian workers to file lawsuits in Israeli courts. In 2008, the average sum claimed by such lawsuits stood at 100,000 shekels. According to Palestinian Center for Policy and Survey Research, 63% of Palestinians opposed PA plans to prosecute Palestinians who work in the settlements. However, 72% of Palestinians support a boycott of the products they sell. Although the Palestinian Authority has criminalized working in the settlements, the director-general at the Palestinian Ministry of Labor, Samer Salameh, described the situation in February 2014 as being "caught between two fires". He said "We strongly discourage work in the settlements, since the entire enterprise is illegal and illegitimate...but given the high unemployment rate and the lack of alternatives, we do not enforce the law that criminalizes work in the settlements." Gush Emunim Underground was a militant organization that operated in 1979–1984. The organization planned attacks on Palestinian officials and the Dome of the Rock. In 1994, Baruch Goldstein of Hebron, a member of Kach carried out the Cave of the Patriarchs massacre, killing 29 Muslim worshipers and injuring 125. The attack was widely condemned by the Israeli government and Jewish community. The Palestinian leadership has accused Israel of "encouraging and enabling" settler violence in a bid to provoke Palestinian riots and violence in retaliation. Violence perpetrated by Israeli settlers against Palestinians constitutes terrorism according to the U.S. Department of State, and former IDF Head of Central Command Avi Mizrahi stated that such violence constitutes "terror." In mid-2008, a UN report recorded 222 acts of Israeli settler violence against Palestinians and IDF troops compared with 291 in 2007. This trend reportedly increased in 2009. Maj-Gen Shamni said that the number had risen from a few dozen individuals to hundreds, and called it "a very grave phenomenon." In 2008–2009, the defense establishment adopted a harder line against the extremists. This group responded with a tactic dubbed "price tagging," vandalizing Palestinian property whenever police or soldiers were sent in to dismantle outposts. From January through to September 2013, 276 attacks by settlers against Palestinians were recorded. Leading religious figures in the West Bank have harshly criticized these tactics. Rabbi Menachem Froman of Tekoa said that "Targeting Palestinians and their property is a shocking thing, (...) It's an act of hurting humanity. (...) This builds a wall of fire between Jews and Arabs." The Yesha Council and Hanan Porat also condemned such actions. Other rabbis have been accused of inciting violence against non-Jews. In response to settler violence, the Israeli government said that it would increase law enforcement and cut off aid to illegal outposts. Some settlers are thought to lash out at Palestinians because they are "easy victims." The United Nations accused Israel of failing to intervene and arrest settlers suspected of violence. In 2008, Haaretz wrote that "Israeli society has become accustomed to seeing lawbreaking settlers receive special treatment and no other group could similarly attack Israeli law enforcement agencies without being severely punished." 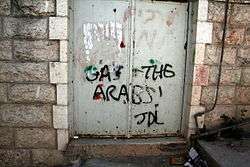 In September 2011, settlers vandalized a mosque and an army base. They slashed tires and cut cables of 12 army vehicles and sprayed graffiti. In November 2011, the United Nations Office for Coordination of Human Affairs (OCHA) in the Palestinian territories published a report on settler violence that showed a significant rise compared to 2009 and 2010. The report covered physical violence and property damage such as uprooted olive trees, damaged tractors and slaughtered sheep. The report states that 90% of complaints filed by Palestinians have been closed without charge. According to EU reports, Israel has created an "atmosphere of impunity" for Jewish attackers, which is seen as tantamount to tacit approval by the state. In the West Bank, Jews and Palestinians live under two different legal regimes and it is difficult for Palestinians to lodge complaints, which must be filed in Hebrew in Israeli settlements. The 27 ministers of foreign affairs of the European Union published a report in May 2012 strongly denouncing policies of the State of Israel in the West Bank and denouncing "continuous settler violence and deliberate provocations against Palestinian civilians." The report by all EU ministers called "on the government of Israel to bring the perpetrators to justice and to comply with its obligations under international law." In July 2014, a day after the burial of three murdered Israeli teens. Khdeir, a 16-year-old Palestinian, was forced into a car by 3 Israeli settlers on an East Jerusalem street. His family immediately reported the fact to Israeli Police who located his charred body a few hours later at Givat Shaul in the Jerusalem Forest. Preliminary results from the autopsy suggested that he was beaten and burnt while still alive. The murder suspects explained the attack as a response to the June abduction and murder of three Israeli teens. The murders contributed to a breakout of hostilities in the 2014 Israel–Gaza conflict. In July 2015, a similar incident occurred where Israeli settlers made an arson attack on two Palestinian houses, one of which was empty; however, the other was occupied, resulting in the burning to death of a Palestinian infant; the four other members of his family were evacuated to the hospital suffering serious injuries. These two incidents received condemnation from the United States, European Union and the IDF. The European Union criticized Israel for "failing to protect the Palestinian population". While the Economy of the Palestinian territories has shown signs of growth, the International Committee of the Red Cross reported that Palestinian olive farming has suffered. According to the ICRC, 10,000 olive trees were cut down or burned by settlers in 2007-2010. Foreign ministry spokesman Yigal Palmor said the report ignored official PA data showing that the economic situation of Palestinians had improved substantially, citing Mahmoud Abbas's comment to The Washington Post in May 2009, where he said "in the West Bank, we have a good reality, the people are living a normal life." Haaretz blamed the violence during the olive harvest on a handful of extremists. In 2010, trees belonging to both Jews and Arabs were cut down, poisoned or torched. In the first two weeks of the harvest, 500 trees owned by Palestinians and 100 trees owned by Jews had been vandalized. In October 2013, 100 trees were cut down. Violent attacks on olive trees seem to be facilitated by the apparently systematic refusal of the Israeli authorities to allow Palestinians to visit their own groves, some times for years, especially in cases where the groves are deemed to be too close to settlements. Pro-Palestinian activists who hold regular protests near the settlements have been accused of stone-throwing, physical assault and provocation. In 2008, Avshalom Peled, head of the Israel Police's Hebron district, called "left-wing" activity in the city dangerous and provocative, and accused activists of antagonizing the settlers in the hope of getting a reaction. 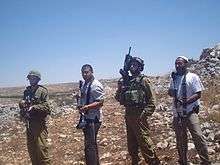 Settlers are targeted by Palestinian armed groups who, according to Human Rights Watch, say that settlers are a legitimate target because they have forfeited their civilian status by residing in settlements that are illegal under international humanitarian law. Both Human Rights Watch and B'tselem rejected this argument on the basis that the legal status of the settlements has no effect the civilian status of their residents. Human Rights Watch said "prohibition against intentional attacks against civilians is absolute". B'tselem said "The settlers constitute a distinctly civilian population, which is entitled to all the protections granted civilians by international law. The Israeli security forces' use of land in the settlements or the membership of some settlers in the Israeli security forces does not affect the status of the other residents living among them, and certainly does not make them proper targets of attack." Fatal attacks on settlers have included firing of rockets and mortars and drive-by shootings, also targeting infants and children. Violent incidents include the murder of Shalhevet Pass, a ten-month-old baby shot by a Palestinian sniper in Hebron, and the murder of two teenagers on 8 May 2001, whose bodies were hidden in a cave near Tekoa. In the Bat Ayin axe attack, children in Bat Ayin were attacked by a Palestinian wielding an axe and a knife. A 13-year-old boy was killed and another was seriously wounded. Rabbi Meir Hai, a father of seven, was killed in a drive-by shooting. In August 2011, five members of one family were killed in their beds. The victims were the father Ehud (Udi) Fogel, the mother Ruth Fogel, and three of their six children—Yoav, 11, Elad, 4, and Hadas, the youngest, a three-month-old infant. According to David Ha'ivri, and as reported by multiple sources, the infant was decapitated. Municipal Environmental Associations of Judea and Samaria, an environmental awareness group, was established by the settlers to address sewage treatment problems and cooperate with the Palestinian Authority on environmental issues. According to a Haaretz study, settlers account for 10% of the population in the West Bank but produce 25% of the sewage output. Beit Duqqu and Qalqilyah have accused settlers of polluting their farmland and villagers claim children have become ill after swimming in a local stream. Legal action was taken against 14 settlements by the Israeli Ministry of the Environment. The Palestinian Authority has also been criticized by environmentalists for not doing more to prevent water pollution. Settlers and Palestinians share the mountain aquifer as a water source, and both generate sewage and industrial effluents that endanger the aquifer. Friends of the Earth Middle East claimed that sewage treatment was inadequate in both sectors. Sewage from Palestinian sources was estimated at 46 million cubic meters a year, and sources from settler sources at 15 million cubic meters a year. A 2004 study found that sewage was not sufficiently treated in many settlements, while sewage from Palestinian villages and cities flowed into unlined cesspits, streams and the open environment with no treatment at all. In a 2007 study, the Israel Nature and Parks Authority and Israeli Ministry of Environmental Protection, found that Palestinian towns and cities produced 56 million cubic meters of sewage per year, 94 percent discharged without adequate treatment, while Israeli sources produced 17.5 million cubic meters per year, 31.5 percent without adequate treatment. According to Palestinian environmentalists, the settlers operate industrial and manufacturing plants that can create pollution as many do not conform to Israeli standards. In 2005, an old quarry between Kedumim and Nablus was slated for conversion into an industrial waste dump. Pollution experts warned that the dump would threaten Palestinian water sources. The Consortium for Applied Research on International Migration (CARIM) has reported in their 2011 migration profile for Palestine that the reasons for individuals to leave the country are similar to those of other countries in the region and they attribute less importance to the specific political situation of the occupied Palestinian territory. Human Rights Watch in 2010 reported that Israeli settlement policies have had the effect of "forcing residents to leave their communities". In 2008, Condoleezza Rice suggested sending Palestinian refugees to South America, which might reduce pressure on Israel to withdraw from the settlements. Sushil P. Seth speculates that Israelis seem to feel that increasing settlements will force many Palestinians to flee to other countries and that the remainder will be forced to live under Israeli terms. Speaking anonymously with regard to Israeli policies in the South Hebron Hills, a UN expert said that the Israeli crackdown on alternative energy infrastructures like solar panels is part of a deliberate strategy in Area C.
"From December 2010 to April 2011, we saw a systematic targeting of the water infrastructure in Hebron, Bethlehem and the Jordan valley. Now, in the last couple of months, they are targeting electricity. Two villages in the area have had their electrical poles demolished. There is this systematic effort by the civil administration targeting all Palestinian infrastructure in Hebron. They are hoping that by making it miserable enough, they [the Palestinians] will pick up and leave." Approximately 1,500 people in 16 communities, living in the area since the 19th century, and dependent on energy produced by these installations duct business are threatened with work stoppage orders from the Israeli administration on their installation of alternative power infrastructure, and demolition orders expected to follow will darken the homes of 500 people. 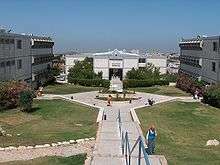 Ariel University, formerly the College of Judea and Samaria, is the major Israeli institution of higher education in the West Bank. With close to 13,000 students, it is Israel's largest public college. The college was accredited in 1994 and awards bachelor's degrees in arts, sciences, technology, architecture and physical therapy. 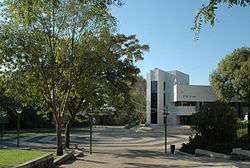 The school's current temporary status is that of a "university institution" conferred by the Israel Defense Forces, but it remains without university accreditation. 500 Arabs begin studies in Ariel saying 'There's no racism here'. 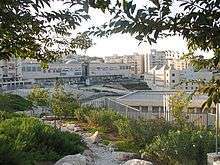 Teacher training colleges include Herzog College in Alon Shvut and Orot Israel College in Elkana. Ohalo College is located in Katzrin, in the Golan Heights. Curricula at these institutions are overseen by the Council for Higher Education in Judea and Samaria (CHE-JS). In March 2012, The Shomron Regional Council was awarded the Israeli Ministry of Education's first prize National Education Award in recognizing its excellence in investing substantial resources in the educational system. The Shomron Regional Council achieved the highest marks in all parameters (9.28 / 10). Gershon Mesika, the head of the regional council, declared that the award was a certificate of honour of its educators and the settlement youth who proved their quality and excellence. In 1983 an Israeli government plan entitled "Master Plan and Development Plan for Settlement in Samaria and Judea" envisaged placing a "maximally large Jewish population" in priority areas to accomplish incorporation of the West Bank in the Israeli "national system". According to Ariel Sharon, strategic settlement locations would work to preclude the formation of a Palestinian state. Palestinians argue that the policy of settlements constitutes an effort to preempt or sabotage a peace treaty that includes Palestinian sovereignty, and claim that the presence of settlements harm the ability to have a viable and contiguous state. This was also the view of the Israeli Vice Prime Minister Haim Ramon in 2008, saying "the pressure to enlarge Ofra and other settlements does not stem from a housing shortage, but rather is an attempt to undermine any chance of reaching an agreement with the Palestinians ..."
Prior to the signing of the Egypt–Israel Peace Treaty, the eruption of the First Intifada, down to the signing of the Israel–Jordan peace treaty in 1994, Israeli governments on the left and right argued that the settlements were of strategic and tactical importance. The location of the settlements was primarily chosen based on the threat of an attack by the bordering hostile countries of Jordan, Syria, and Egypt and possible routes of advance into Israeli population areas. These settlements were seen as contributing to the security of Israel at a time when peace treaties had not been signed. An early evacuation took place in 1982 as part of the Egypt–Israel Peace Treaty, when Israel was required to evacuate its settlers from the 18 Sinai settlements. Arab parties to the conflict had demanded the dismantlement of the settlements as a condition for peace with Israel. The evacuation was carried out with force in some instances, for example in Yamit. The settlements were demolished, as it was feared that settlers might try to return to their homes after the evacuation. Israel's unilateral disengagement plan took place in 2005. It involved the evacuation of settlements in the Gaza Strip and part of the West Bank, including all 21 settlements in Gaza and four in the West Bank, while retaining control over Gaza's borders, coastline, and airspace. Most of these settlements had existed since the early 1980s, some were over 30 years old; the total population involved was more than 10,000. There was significant opposition to the plan among parts of the Israeli public, and especially those living in the territories. George W. Bush said that a permanent peace deal would have to reflect "demographic realities" in the West Bank regarding Israel's settlements. Within the former settlements, almost all buildings were demolished by Israel, with the exception of certain government and religious structures, which were completely emptied. Under an international arrangement, productive greenhouses were left to assist the Palestinian economy but these were destroyed within hours by Palestinian looters. Following the withdrawal, many of the former synagogues were torched and destroyed by Palestinians. The Palestinian leadership "maintained" that the synagogues were "symbols of Israeli occupation." Kofi Annan, the Secretary-General of the United Nations at the time, said the Palestinian Authority had a "moral responsibility to protect the synagogues as places with religious significance." Some believe that settlements need not necessarily be dismantled and evacuated, even if Israel withdraws from the territory where they stand, as they can remain under Palestinian rule. These ideas have been expressed both by left-wing Israelis, and by Palestinians who advocate the two-state solution, and by extreme Israeli right-wingers and settlers who object to any dismantling and claim links to the land that are stronger than the political boundaries of the state of Israel. The Israeli government has often threatened to dismantle outposts. Some have actually been dismantled, occasionally with use of force; this led to settler violence. American refusal to declare the settlements illegal was said to be the determining factor in the 2011 attempt to declare Palestinian statehood at the United Nations, the so-called Palestine 194 initiative. Israel announced additional settlements in response to the Palestinian diplomatic initiative and Germany responded by moving to stop deliveries to Israel of submarines capable of carrying nuclear weapons. Finally in 2012, several European states switched to either abstain or vote for statehold in response to continued settlement construction. Israel approved further settlements in response to the vote, which brought further worldwide condemnation. The settlements have been a source of tension between Israel and the U.S. Jimmy Carter regarded the settlements as illegal and tactically unwise. Ronald Reagan stated that they were legal but an obstacle to negotiations. In 1991, the U.S. delayed a subsidized loan to pressure Israel on the subject of settlement-building in the Jerusalem-Bethlehem corridor. In 2005, U.S. declared support for "the retention by Israel of major Israeli population centers as an outcome of negotiations," reflecting the statement by George W. Bush that a permanent peace treaty would have to reflect "demographic realities" in the West Bank. In June 2009, Barack Obama said that the United States "does not accept the legitimacy of continued Israeli settlements." Final status proposals have called for retaining long-established communities along the Green Line and transferring the same amount of land in Israel to the Palestinian state. The Clinton administration proposed that Israel keep some settlements in the West Bank, especially those in large blocs near the pre-1967 borders of Israel, with the Palestinians receiving concessions of land in other parts of the country. Both Clinton and Tony Blair pointed out the need for territorial and diplomatic compromise based on the validity of some of the claims of both sides. Fayed Mustafa, Palestinian ambassador to Russia, called for the return of Palestinian territories to Egypt and Jordan if talks failed. As Minister of Defense, Ehud Barak approved a plan requiring security commitments in exchange for withdrawal from the West Bank. Barak also expressed readiness to cede parts of East Jerusalem and put the holy sites in the city under a "special regime." On 14 June 2009, Israeli Prime Minister Benjamin Netanyahu, as an answer to U.S. President Barack Obama's speech in Cairo, delivered a speech setting out his principles for a Palestinian-Israeli peace, among others, he alleged "... we have no intention of building new settlements or of expropriating additional land for existing settlements." In March 2010, the Netanyahu government announced plans for building 1,600 housing units in Ramat Shlomo across the Green Line in East Jerusalem during U.S. Vice President Joe Biden's visit to Israel causing a diplomatic row. On 6 September 2010, Jordanian King Abdullah II and Syrian President Bashar al-Assad said that Israel would need to withdraw from all of the lands occupied in 1967 in order to achieve peace with the Palestinians. Bradley Burston has said that a negotiated or unilateral withdraw from most of the settlements in the West Bank is gaining traction in Israel. In November 2010, the United States offered to "fight against efforts to delegitimize Israel" and provide extra arms to Israel in exchange for a continuation of the settlement freeze and a final peace agreement, but failed to come to an agreement with the Israelis on the exact terms. In December 2010, the United States criticised efforts by the Palestinian Authority to impose borders for the two states through the United Nations rather than through direct negotiations between the two sides. In February 2011, it vetoed a draft resolution to condemn all Jewish settlements established in the occupied Palestinian territory since 1967 as illegal. The resolution, which was supported by all other Security Council members and co-sponsored by nearly 120 nations, would have demanded that "Israel, as the occupying power, immediately and completely ceases all settlement activities in the occupied Palestinian territory, including East Jerusalem and that it fully respect its legal obligations in this regard." The U.S. representative said that while it agreed that the settlements were illegal, the resolution would harm chances for negotiations. Israel's deputy Foreign Minister, Daniel Ayalon, said that the "UN serves as a rubber stamp for the Arab countries and, as such, the General Assembly has an automatic majority," and that the vote "proved that the United States is the only country capable of advancing the peace process and the only righteous one speaking the truth: that direct talks between Israel and the Palestinians are required." Palestinian negotiators, however, have refused to resume direct talks until Israel ceases all settlement activity. In November 2009, Israeli Prime Minister Netanyahu issued a 10-month settlement freeze in the West Bank in an attempt to restart negotiations with the Palestinians. The freeze did not apply to building in Jerusalem in areas across the green line, housing already under construction and existing construction described as "essential for normal life in the settlements" such as synagogues, schools, kindergartens and public buildings. The Palestinians refused to negotiate without a complete halt to construction. In the face of pressure from the United States and most world powers supporting the demand by the Palestinian Authority that Israel desist from settlement project in 2010, Israel's ambassador to the UN Meron Reuben said Israel would only stop settlement construction after a peace agreement is concluded, and expressed concern were Arab countries to press for UN recognition of a Palestinian state before such an accord. He cited Israel's dismantlement of settlements in both the Sinai which took place after a peace agreement, and its unilateral dismantlement of settlements in the Gaza Strip. He presumed that settlements would stop being built were Palestinians to establish a state in a given area. The Clinton Parameters, a 2000 peace proposal by then U.S. President Bill Clinton, included a plan on which the Palestinian State was to include 94–96% of the West Bank, and around 80% of the settlers were to be under Israeli sovereignty, and in exchange for that, Israel will concede some territory (so called 'Territory Exchange' or 'Land Swap') within the Green Line (1967 borders). The swap would consist of 1–3% of Israeli territory, such that the final borders of the West Bank part of the Palestinian state would include 97% of the land of the original borders. In 2010, Palestinian Authority President Mahmoud Abbas said that the Palestinians and Israel have agreed on the principle of a land swap. The issue of the ratio of land Israel would give to the Palestinians in exchange for keeping settlement blocs is an issue of dispute, with the Palestinians demanding that the ratio be 1:1, and Israel insisting that other factors be considered as well. Under any peace deal with the Palestinians, Israel intends to keep the major settlement blocs close to its borders, which contain over 80% of the settlers. Prime Ministers Yitzhak Rabin, Ariel Sharon, and Benjamin Netanyahu have all stated Israel's intent to keep such blocs under any peace agreement. U.S. President George W. Bush acknowledged that such areas should be annexed to Israel in a 2004 letter to Prime Minister Sharon. The European Union position is that any annexation of settlements should be done as part of mutually agreed land swaps, which would see the Palestinians controlling territory equivalent to the territory captured in 1967. The EU says that it will not recognise any changes to the 1967 borders without an agreement between the parties. Israeli Foreign Minister Avigdor Lieberman has proposed a plan which would see settlement blocs annexed to Israel in exchange for heavily Arab areas inside Israel as part of a population exchange. According to Mitchell G. Bard: "Ultimately, Israel may decide to unilaterally disengage from the West Bank and determine which settlements it will incorporate within the borders it delineates. Israel would prefer, however, to negotiate a peace treaty with the Palestinians that would specify which Jewish communities will remain intact within the mutually agreed border of Israel, and which will need to be evacuated. Israel will undoubtedly insist that some or all of the "consensus" blocs become part of Israel". A number of proposals for the granting of Palestinian citizenship or residential permits to Jewish settlers in return for the removal of Israeli military installations from the West Bank have been fielded by such individuals as Arafat, Ibrahim Sarsur and Ahmed Qurei. Israeli Minister Moshe Ya'alon said in April 2010 that "just as Arabs live in Israel, so, too, should Jews be able to live in Palestine." ... "If we are talking about coexistence and peace, why the [Palestinian] insistence that the territory they receive be ethnically cleansed of Jews?". The idea has been expressed by both advocates of the two-state solution and supporters of the settlers and conservative or fundamentalist currents in Israeli Judaism that, while objecting to any withdrawal, claim stronger links to the land than to the state of Israel. On 19 June 2011, Haaretz reported that the Israeli cabinet voted to revoke Defense Minister Ehud Barak's authority to veto new settlement construction in the West Bank, by transferring this authority from the Agriculture Ministry, headed by Barak ally Orit Noked, to the Prime Minister's office. In 2009, newly elected Prime Minister Benjamin Netanyahu said: "I have no intention of building new settlements in the West Bank... But like all the governments there have been until now, I will have to meet the needs of natural growth in the population. I will not be able to choke the settlements." On 15 October 2009, he said the settlement row with the United States had been resolved. In April 2012, four illegal outposts were retroactively legalized by the Israeli government. In June 2012, the Netanyahu government announced a plan to build 851 homes in five settlements: 300 units in Beit El and 551 units in other settlements. Amid peace negotiations that showed little signs of progress, Israel issued on 3 November 2013, tenders for 1,700 new homes for Jewish settlers. The plots were offered in nine settlements in areas Israel says it intends to keep in any peace deal with the Palestinians. On 12 November, Peace Now revealed that the Construction and Housing Ministry had issued tenders for 24,000 more settler homes in the West Bank, including 4,000 in East Jerusalem. 2,500 units were planned in Ma'aleh Adumim, some 9,000 in the Gush Etzion Region, and circa 12,000 in the Binyamin Region, including 1,200 homes in the E1 area in addition to 3,000 homes in previously frozen E1 projects. Circa 15,000 homes of the 24,000 plan would be east of the West Bank Barrier and create the first new settlement blocs for two decades, and the first blocs ever outside the Barrier, far inside the West Bank. As stated before, the Israeli government (as of 2015) has a program of residential subsidies in which Israeli settlers receive about double that given to Israelis in Tel Aviv and Jerusalem. As well, settlers in isolated areas receive three times the Israeli national average. From the beginning of 2009 to the end of 2013, the Israeli settlement population as a whole increased by a rate of over 4% per year. A New York Times article in 2015 stated that said building had been "at the heart of mounting European criticism of Israel." i. ^ Statistics for the West Bank ("Judea and Samaria") from the Statistical Abstract of Israel 2013 No. 64. Total population = 341,400 in 123 "Jewish localities"
Jews = 334,200 in 123 "Jewish localities"
Arabs = 0 in 0 "Non-Jewish localities"
"Settlement throughout the entire Land of Israel is for security and by right. A strip of settlements at strategic sites enhances both internal and external security alike, as well as making concrete and realizing our right to Eretz Israel." "New settlements will be established only on State-owned land, and not on private Arab-owned land which is duly registered. We should ensure that there is no need for the expropriation of private plots from the members of the minorities." "As is known, it is the task of the land settlement department to initiate, plan and implement the settlement enterprise according to the decisions of the Government and of the joint Government-World Zionist Organization Committee for Settlement." "This will enable us to bring about the dispersion … to the presently empty areas of J&S." "In light of the current negotiations on the future of Judea and Samaria, it will now become necessary for us to conduct a race against time. During this period, everything will be mainly determined by the facts we establish in these territories and less by any other considerations. This is therefore the best time for launching an extensive and comprehensive settlement momentum, particularly on the Judea and Samaria hilltops which are not easily passable by nature and which preside over the Jordan Valley on the cast and over the Coastal Plain on the west." "It is therefore significant to stress today, mainly by means of actions, that the autonomy does not and will not apply to the territories but only to the Arab population thereof. This should mainly find expression by establishing facts on the ground. Therefore, the state-owned lands and the uncultivated barren lands in Judea and Samaria ought to be seized right away, with the purpose of settling the areas between and around the centers occupied by the minorities so as to reduce to the minimum the danger of an additional Arab state being established in these territories. Being cut off by Jewish settlements the minority population will find it difficult to form a territorial and political continuity." "There mustn't be even the shadow of a doubt about our intention to keep the territories of Judea and Samaria for good. Otherwise, the minority population may get into a state of growing disquiet which will eventually result in recurrent efforts to establish an additional Arab state in these territories. The best and most effective way of removing every shadow of a doubt about our intention to hold on to Judea and Samaria forever is by speeding up the settlement momentum in these territories." "Thus, it is necessary to establish additional settlements near every existing settlement in Judea and Samaria, so as to create settlement clusters in homogenous settlement regions ..."
"Over the next 5 years it is necessary to establish 12-15 rural and urban settlements per annum in Judea and Samaria, so that in five years from now the number of settlements will grow by 60-75 and the Jewish population thereof will amount to between 120,000 and 150,000 people." Gershom Gorenberg (2007). The Accidental Empire: Israel and the Birth of the Settlements, 1967–1977. Macmillan. p. 363. So argued the government of Israel before the country's Supreme Court in the spring of 2005, defending its decision to dismantle all Israeli settlements in the Gaza Strip and four in the northern West Bank. ↑ Anthony Cordesman, Jennifer Moravitz, The Israeli-Palestinian war: escalating to nowhere, Greenwood Publishing Group, Center for Strategic and International Studies, 2005 p.432. :'Between 1993 and 1999, settlers established 42 "unofficial" settlements, only four of which were subsequently dismantled. More than a dozen new settlements were established between the 1998 Wye Accord [sic: it's the Wye River Memorandum, but Oslo Accords] and the outbreak of war, although former Prime Minister Netanyahu supposedly promised Clinton that he would halt expansion.' p.433. ↑ Marwan Bishara, Palestine/Israel: peace or apartheid Zed Books, 2003 p.133: 'The settlement expansion has continued unabated...and accelerated after the launch of the peace process.' p.133. ↑ Baylis Thomas, The Dark Side of Zionism: Israel's Quest for Security Through Dominance Lexington Books, 3011 p.137:'Six years after the agreement there were more Israeli settlements, less freedom of movement, and worse economic conditions." Settlement building and roads for Jewish settlers proceeded at a frenetic pace under Barak – the classic Zionist maneuver of creating of facts on the ground to preclude a Palestinian state.' p.137. ↑ Barahona, Ana (2013). Bearing Witness - Eight weeks in Palestine. London: Metete. p. 49. ISBN 978-1-908099-02-0. ↑ Uri Blau, 'Haaretz Investigation: U.S. Donors Gave Settlements More Than $220 Million in Tax-exempt Funds Over Five Years,' Haaretz 7 December 2015. Roberts, Adam. "Prolonged Military Occupation: The Israeli-Occupied Territories Since 1967". The American Journal of International Law. American Society of International Law. 84 (1): 85–86. doi:10.2307/2203016. The international community has taken a critical view of both deportations and settlements as being contrary to international law. General Assembly resolutions have condemned the deportations since 1969, and have done so by overwhelming majorities in recent years. Likewise, they have consistently deplored the establishment of settlements, and have done so by overwhelming majorities throughout the period (since the end of 1976) of the rapid expansion in their numbers. The Security Council has also been critical of deportations and settlements; and other bodies have viewed them as an obstacle to peace, and illegal under international law. Pertile, Marco (2005). "'Legal Consequences of the Construction of a Wall in the Occupied Palestinian Territory': A Missed Opportunity for International Humanitarian Law?". In Conforti, Benedetto; Bravo, Luigi. The Italian Yearbook of International Law. 14. Martinus Nijhoff Publishers. p. 141. ISBN 978-90-04-15027-0. the establishment of the Israeli settlements in the Occupied Palestinian Territory has been considered illegal by the international community and by the majority of legal scholars. Barak-Erez, Daphne (2006). "Israel: The security barrier—between international law, constitutional law, and domestic judicial review". International Journal of Constitutional Law. Oxford University Press. 4 (3): 548. doi:10.1093/icon/mol021. The real controversy hovering over all the litigation on the security barrier concerns the fate of the Israeli settlements in the occupied territories. Since 1967, Israel has allowed and even encouraged its citizens to live in the new settlements established in the territories, motivated by religious and national sentiments attached to the history of the Jewish nation in the land of Israel. This policy has also been justified in terms of security interests, taking into consideration the dangerous geographic circumstances of Israel before 1967 (where Israeli areas on the Mediterranean coast were potentially threatened by Jordanian control of the West Bank ridge). The international community, for its part, has viewed this policy as patently illegal, based on the provisions of the Fourth Geneva Convention that prohibit moving populations to or from territories under occupation. International Labour Organization (2005). "The situation of workers of the occupied Arab territories" (PDF). p. 14. The international community considers Israeli settlements within the occupied territories illegal and in breach of, inter alia, United Nations Security Council resolution 465 of 1 March 1980 calling on Israel "to dismantle the existing settlements and in particular to cease, on an urgent basis, the establishment, construction and planning of settlements in the Arab territories occupied since 1967, including Jerusalem". ↑ "UN Security Council Resolution 465". "What next for Gaza and West Bank?". BBC. 30 August 2005. Retrieved 5 January 2010. Most Israelis support the pullout, but some feel the government has given in to Palestinian militant groups, and worry that further withdrawals will follow. Palestinian critics point out that Gaza will remain under Israeli control, and that they are being denied a political say in the disengagement process. Yearbook of the United Nations 2005. United Nations Publications. 2007. p. 514. The Israeli Government was preparing to implement an unprecedented initiative: the disengagement of all Israeli civilians and forces from the Gaza Strip and the dismantling of four settlements in the northern West Bank. Yael Yishai (1987). Land Or Peace. Hoover Press. p. 58. During 1982 Israel's government stuck to its territorial policy in word and deed. All the settlements in Sinai were evacuated in accordance with the Camp David Accords, but settlement activity in the other territories continued uninterrupted. A few days after the final withdrawal from Sinai had been completed, Begin announced that he would introduce a resolution barring future governments from dismantling settlements, even as a result of peace negotiations. ↑ "Summary of the Advisory Opinion of 9 July 2004" (PDF). International Court of Justice. 9 July 2004. p. 10. Retrieved 9 November 2011. ↑ Natasha Mozgovaya, Reuters and The Associated Press,Palestinians call on UN to stop Israeli settlement legalization, at Haaretz, 26 April 2012. ↑ Michal Shmulovich (24 April 2012). "World leaders blast legalization of three West Bank outposts". The Times of Israel. Retrieved 29 April 2012. ↑ Michal Shmulovich (26 April 2012). "EU urges Israel to reverse its authorization of three West Bank outposts". The Times of Israel. Retrieved 29 April 2012. ↑ "Israel, the Conflict and Peace: Answers to frequently asked questions". Israel Ministry of Foreign Affairs. November 2007. Are Israeli settlements legal? ↑ "Palestinians condemn settlements plan". The Financial Times. 20 May 2011. ↑ "OIC Secretary General hails EU decision on Israeli settlements". United Nations Information System on the Question of Palestine - OIC Statement to UN. Accessed March 14, 2015. 1 2 "Israeli settlement plan denounced". BBC. 8 November 2009. Retrieved 16 March 2010. ↑ "Russia urges Israel to halt settlement construction". RIA Novosti. 2 November 2011. Retrieved 7 June 2012. ↑ "Britain: Israeli settlements are 'illegal' and 'obstacle' to peace". Haaretz. 4 November 2009. Retrieved 16 March 2010. ↑ "France condemns Israel over settlement building decision". Business Standard. 21 March 2014. Retrieved 5 April 2014. ↑ "EU's Ashton SAYS Israeli settlement plans hurt peace moves". Reuters. 15 March 2010. Retrieved 16 March 2010. ↑ 'The economics at the heart of Israel's illegal settlements,' Ma'an News Agency 7 January 2015. ↑ "Israel okays 2,610 homes for Jews and Arabs in E. Jerusalem". ↑ Sherwood, Harriet (26 July 2012). "Population of Jewish settlements in West Bank up 15,000 in a year". The Guardian. London. ↑ "Facts About Jewish Settlements in the West Bank". ↑ "Jewish Population in Judea & Samaria Growing Significantly". ↑ "Report on Israeli Settlement in the Occupied Territories". Foundation for Middle East Peace. Retrieved 2012-08-05. ↑ Division for Palestinian Rights (DPR), Israeli settlements in Gaza and the West Bank, Part II, chapter III. "The magnitude of settlements". 1 July 1984. Part I. ↑ Division for Palestinian Rights/CEIRPP, SUPR Bulletin No. 9-10 (letters of 19 September 1979 and 18 October 1979). Original UNGA/UNSC publication of the "Drobles Plan" in pdf: Letter dated 18 October 1979 from the Chairman of the Committee on the Exercise of the Inalienable Rights of the Palestinian People addressed to the Secretary-General, see ANNEX (doc.nrs. A/34/605 and S/13582 d.d. 22-10-1979). ↑ UNGA/UNSC, Letter dated 19 June 198l from the Acting Chairman of the Committee on the Exercise of the Inalienable Rights of the Palestinian People to the Secretary-General (A/36/341 and S/14566 d.d.19-06-1981). ↑ Presentation of the Oslo II Accord in the Knesset by Rabin: MFA, Prime Minister Yitzhak Rabin: Ratification of the Israel-Palestinian Interim Agreement—The Knesset October 5, 1995. ↑ The origins and evolution of the Palestine problem, Part V (1989 – 2000), chap. III, E. CEIRPP, 2014. 1 2 3 4 "Comprehensive Settlement Population 1972-2010". Foundation for Middle East Peace. Retrieved 18 March 2013. ↑ Akiva Eldar, Israel Defense Ministry plan earmarks 10 percent of West Bank for settlement expansion. Haaretz, 30 March 2012. ↑ Gershom Gorenberg, The Accidental Empire(New York: Times Books, Henry Holt and Company, 2006), 21. 1 2 "Israel Studies An Anthology: Jewish Settlement in Israel". Jewish Virtual Library. Retrieved 2016-06-10. ↑ Eytan Sat, interview, Yehudah Harel, interview; Admoni, Asor, 23. ↑ Gorenberg,The Accidental empire, 54. ↑ Gorenberg,The Accidental empire, 4. ↑ Avraham Yitzhak Hacohen Kook, Orot (Jerusalem: Mossad Harav Kook, 5753),9. ↑ A. Ben-Ami, ed., HaKol: The Peace Frontiers of Israel (Tel Aviv: Madaf, 1967), 65-75. ↑ Mashe Shamir, "Min Haplishtiut--El Hahar," Ma'ariv, July 15, 1967. ↑ "Israel launches massive new West Bank settlement plans", Israel Herald. 31 August 2014. ↑ Joshua L. Gleis, Withdrawing Under Fire: Lessons Learned from Islamist Insurgencies, (Washington, D.C.:Potomac Books, Inc., 2011), Chapter 7. ↑ Erlanger, Steve (9 March 2005). "Israeli Report Condemns Support for Settlement Outposts". New York Times. ↑ "Silwan settlers plan Passover festival in bid to curry favor with public". Retrieved 28 July 2016. ↑ Katz, Yossi; Lehr, John C. (1 January 1995). "Symbolism and Landscape: The Etzion Bloc in the Judean Mountains". Middle Eastern Studies. 31 (4): 730–743. JSTOR 4283758. ↑ "The hostility of Hebron". 18 February 2003. Retrieved 28 July 2016 – via bbc.co.uk. ↑ "Seventeen Gaza Settlements Evacuated - Fox News". 18 August 2005. Retrieved 28 July 2016. ↑ "Israeli Settler Population 1972-2006". Foundation for Middle East Peace. Retrieved 15 March 2010. ↑ "Population by year in West Bank settlements". B'Tselem. Retrieved 14 March 2010. ↑ "המתנחלים 2012". מועצת יש"ע. 1 2 3 "Housing minister sees 50% more settlers in West Bank by 2019". Haaretz.com. Retrieved 10 September 2015. ↑ "מכון ירושלים לחקר ישראל". Retrieved 28 July 2016. ↑ "Palestine-Israel Journal: Settlements: A Geographic and Demographic Barrier to Peace". Retrieved 28 July 2016. 1 2 "Residents in occupied Golan Heights fear creeping Israeli presence". middleeasteye.net. Retrieved 10 September 2015. ↑ "S/14268 Report of the Security Council Commission Established Under Resolution 446 (1979)". United Nations. para. 164. ↑ "Comprehensive Settlement Population 1972-2008—FMEP". Fmep.org. Retrieved 9 May 2010. ↑ Sources of Population Growth: Total Israeli Population and Settler Population, 1991 - 2003, Foundation for Middle East Peace. ↑ Settler Population Growth East and West of the Barrier, 2000-2007, Foundation for Middle East Peace. 1 2 "Palestinians shun Israeli settlement restriction plan". BBC. 25 November 2009. Retrieved 10 December 2009. ↑ Mélanie Jacques (20 September 2012). Armed Conflict and Displacement: The Protection of Refugees and Displaced Persons Under International Humanitarian Law. Cambridge University Press. pp. 77–124. ISBN 978-1-107-00597-6. Retrieved 8 April 2013. ↑ Entous, Adam (31 December 2007). "Olmert curbs WBank building, expansion and planning". Reuters. Retrieved 31 December 2007. 1 2 CBS News, 2010 Jul 6, "Group: Israel Controls 42% of West Bank: Settlements Occupy Land Seized from Palestinians in Defiance of 1979 Court Ban, Israeli Human Rights Group Says"
↑ Phoebe Greenwood, 'Palestinians prepare to lose the solar panels that provide a lifeline,' at The Guardian, 14 March 2012. ↑ Detained, interrogated, beaten: Demand protection for Palestinian children (Amnesty USA, June 2015) "While Palestinian children and adults face Israeli military courts, Jewish Israeli settlers benefit from Israeli civil law. Israel gives Jewish settlers a different system of justice - even though they are living illegally in the very same occupied Palestinian territories." ↑ Jonathan Lis (13 May 2012). "In about-face, Israeli ministers block bill to annex West Bank settlements". Haaretz. Retrieved 8 June 2012. 1 2 "Israel launches massive new West Bank settlement plans". Israel Herald. 31 August 2014. Retrieved 1 September 2014. ↑ Jean-Pierre Filiu, Gaza: A History, Oxford University Press, 2014 p.196. ↑ Israel must withdraw all settlers or face ICC, says UN report (The Guardian, 31 January 2013) "Israel (...) was in violation of article 49 of the fourth Geneva convention, which forbids the transfer of civilian populations to occupied territory (...) The UNHRC report broadly restated international consensus on the illegality of Israeli settlements"
↑ "Jewish settlers in West Bank building curb protest". BBC. 9 December 2009. Retrieved 12 December 2009. ↑ GC4 Part III : Status and treatment of protected persons #Section III : Occupied territories "the Occupying Power shall not deport or transfer parts of its own civilian population into the territory it occupies" International Committee of the Red Cross. ↑ Emma Playfair, ed. (1992). International Law and the Administration of Occupied Territories. USA: Oxford University Press. p. 396. ISBN 0-19-825297-8. ↑ Cecilia Albin (2001). Justice and Fairness in International Negotiation. Cambridge: Cambridge University Press. p. 150. ISBN 0-521-79725-X. ↑ Mark Gibney; Stanlislaw Frankowski (1999). Judicial Protection of Human Rights: Myth or Reality?. Westport, CT: Praeger/Greenwood. p. 72. ISBN 0-275-96011-0. ↑ Gregory S. Mahler (2004). Politics and government in Israel: the maturation of a modern state. Rowman & Littlefield. p. 314. ISBN 978-0-7425-1611-3. Retrieved 7 December 2010. ↑ Gerson, Allan. Israel, the West Bank, and International law, Routledge, 28 September 1978, ISBN 0-7146-3091-8, p. 82. 1 2 "Letter of the State Department Legal Advisor, Mr. Herbert J. Hansell, Concerning the Legality of Israeli Settlements in the Occupied Territories", cited in Progress report—The human rights dimensions of population transfer including the implantation of settler prepared by Mr. Awn Shawhat Al-Khasawneh. ↑ fmep.org. Retrieved 13 May 2007. ↑ Sallon, Hélène (28 June 2014). "La France durcit sa position face à la colonisation israélienne". Retrieved 28 July 2016 – via Le Monde. ↑ "EU states promote settler boycott amid Israel crisis". Retrieved 28 July 2016. ↑ Gorenberg, Gershom. "The Accidental Empire". New York: Times Books, Henry Holt and Company, 2006. p. 99. ↑ The Carter Administration View: "Settlements are Inconsistent with International Law"
↑ "Canadian Policy on Key Issues in the Israeli-Palestinian Conflict". Department of Foreign Affairs and International Trade. ↑ Howard Grief, The Legal Foundation and Borders of Israel Under International Law, Mazo Publishers, p.662. cf.p.191. ↑ The Missing Reversioner: Reflections on the Status of Judea and Samaria, in Israel Law Review,3 1968 pp.279-301. ↑ Jerusalem and the Holy Places, Anglo-Israel Association, London 1968. ↑ Julius Stone,No Peace-No War in the Middle East, Maitland Publications, Sydney 1969. ↑ Julius Stone, Israel and Palestine:Assault on the Law of Nations, Johns Hopkins University Press, Baltimore, 1981. ↑ Stephen M. Schwebel, What Weight to Conquest, in American Journal of International Law, vol.64, 1970 pp.344-347. ↑ Palestinian Self-Determination: Possible Futures for the Unallocated Territories of the Palestine Mandate, Yale Studies in World Public Order, 147 (1978-1979) vol.5 1978 pp.147-172. ↑ Stephen M. Schwebel (1994). Justice in International Law: Selected Writings (What Weight to Conquest?). Cambridge: Cambridge University Press. pp. 521–526. ISBN 0-521-46284-3. ↑ Julius Stone (1982). Israel and Palestine: Assault on the Law of Nations. Dashing. p. 52. ISBN 0-9751073-0-5. ↑ Harel, Amos. "Settlements grow on Arab land, despite promises made to U.S.". Haaretz 24 October 2006. Haaretz. Retrieved 14 September 2010. ↑ Kretzmer, David (2002). The occupation of justice: the Supreme Court of Israel and the Occupied Territories. SUNY Press,. p. 87. ISBN 0-7914-5337-5. Helmreich, Jeffrey. Diplomatic and Legal Aspects of the Settlement Issue, Jerusalem Issue Brief, Jerusalem Center for Public Affairs, Vol. 2, No. 16, 19 January 2003. Disputed territories - Forgotten facts about the West Bank and Gaza strip, Israeli Ministry of Foreign Affairs, 1 February 2003. Retrieved 29 January 2008. ↑ Erlanger, Steven (21 November 2006). "Israeli Map Says West Bank Posts Sit on Arab Land". The New York Times. Retrieved 5 May 2010. ↑ "Settlements 'violate Israeli law'". BBC News. 21 November 2006. Retrieved 5 May 2010. ↑ "Reports". Retrieved 28 July 2016. 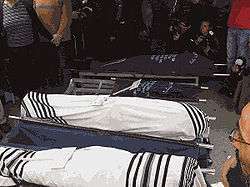 ↑ שרגאי, נדב (14 March 2007). "דו"ח: 32% מההתנחלויות - על שטח פלשתיני פרטי". Retrieved 28 July 2016 – via Haaretz. ↑ Wilson, Scott. "West Bank Settlements Often Use Private Palestinian Land, Study Says". The Washington Post. Retrieved 5 May 2010. ↑ "Haaretz - Israel News - Haaretz.com". Retrieved 28 July 2016. ↑ "Court case reveals how settlers illegally grab West Bank lands". Retrieved 28 July 2016. Haaretz, Uri Blau, Secret Israeli database reveals full extent of illegal settlement. 30 January 2009. The published document (in Hebrew): http://www.fmep.org/analysis/reference/israeli-defense-ministry-database-on-illegal-construcion-in-the-territories. Part of it was translated in english by Yesh Din: "Spiegel Database" of West Bank settlements and outposts developed by the Israeli Ministry of Defense. ↑ "Jerusalem land seizures 'illegal'". BBC News. 1 February 2005. Retrieved 5 May 2010. ↑ "Israeli court orders settlers to return land to Palestinian owners - Diplomacy & Defense". Retrieved 28 July 2016. ↑ Barahona, Ana (2013). Bearing Witness - Eight weeks in Palestine. London: Metete. p. 128. ISBN 978-1-908099-02-0. ↑ Barahona, Ana (2013). Bearing Witness - Eight weeks in Palestine. London: Metete. p. 106. ISBN 978-1-908099-02-0. ↑ "Taking control of the land in the West Bank". ↑ "Forbidden Roads" (PDF). B'Tselem. ↑ Barahona, Ana (2013). Bearing Witness - Eight weeks in Palestine. London: Metete. p. 31. ISBN 978-1-908099-02-0. ↑ Barahona, Ana (2013). Bearing Witness - Eight weeks in Palestine. London: Metete. p. 42. ISBN 978-1-908099-02-0. ↑ Barahona, Ana (2013). Bearing Witness - Eight weeks in Palestine. London: Metete. pp. 98 and following. ISBN 978-1-908099-02-0. ↑ "Who lost? The people of Israel". Retrieved 28 July 2016. ↑ "Guide to the West Bank barrier". BBC News. Retrieved 5 January 2010. ↑ "Q&A: What is the West Bank barrier?". BBC News. 15 September 2005. Retrieved 5 January 2010. 1 2 3 4 5 Sydow, Christoph (2012-10-30). "Activists Seek Ban on Trade with Israeli Settlers". Spiegel. Retrieved 2012-11-02. ↑ Jodi Rudoren, 'In West Bank Settlements, Israeli Jobs Are Double-Edged Sword,' at New York Times, 10 February 2014. ↑ World Bank (October 2, 2013). "West Bank and Gaza:Area C and the Future of the Palestinian Economy" (PDF). Poverty Reduction and Economic Management Department (Report No. AUS2922). Retrieved 10 April 2014. 1 2 3 Jihan Abdalla (18 February 2014). "A Palestinian contradiction: working in Israeli settlements". Al-Monitor. 1 2 3 "20,000 Palestinians working in settlements, survey finds". Retrieved 28 July 2016. ↑ "Palestinian workers in Israeli West Bank settlements - 2008". Kav LaOved. ↑ "Palestinians oppose settlement labor ban". Retrieved 28 July 2016. ↑ Kershner, Isabel (25 September 2008). "Radical Settlers Take On Israel". New York Times. ↑ Kraft, Dina (8 October 2008). "Radical settlers using violence against Jews". ↑ "Erekat: Settler violence reflects Israeli policy". Retrieved 28 July 2016. 1 2 "'Hundreds join' settler violence". 2 October 2008. Retrieved 28 July 2016 – via bbc.co.uk. ↑ Hider, James (15 October 2009). "West Bank settlers use 'price tag' tactic to punish Palestinians". The Times. London. Retrieved 16 October 2009. ↑ Amira Hass, 'Gambling on Blair's Palestinian casino,' at Haaretz 1 October 2013. The statistics included 527 residential demolitions and 862 Palestinians uprooted from their homes. ↑ "Rabbi slams Jewish 'hooligans' - Israel News, Ynetnews". Ynetnews.com. 1995-06-20. Retrieved 2016-06-10. ↑ "Login". Retrieved 28 July 2016. ↑ Gee, Robert W. (25 August 2008). "Settlers Increase Attacks On Palestinians In West Bank". ↑ "Defeat settler terror". Haaretz. 27 October 2008. ↑ "EU report notes huge increase in Jewish settler attacks". Retrieved 28 July 2016. ↑ Kershner, Isabel (6 July 2014). "Suspects Arrested in Death of Palestinian Youth, Israeli Police Say". The New York Times. Retrieved 6 July 2014. ↑ "Official: Autopsy shows Palestinian youth burnt alive". Ma'an News Agency. 5 July 2014. Retrieved 6 July 2014. ↑ "Palestinian teen abducted, killed in suspected revenge attack". Ma'an News Agency. 2 July 2014. Retrieved 6 July 2014. ↑ Ben Zion, Ilan; Berman, Lazar (2 July 2014). "Arab teen killed in capital; revenge attack suspected". The Times of Israel. Archived from the original on 2014-07-04. Retrieved 2014-07-04. ↑ Assaf Sharon, "Failure in Gaza", New York Review of Books, 25 September 2014, pp. 20-24. ↑ Hoff, Mallory (3 July 2014). "Family of slain Palestinian teen lives in Sacramento". KCRA Television Sacramento. Retrieved 4 July 2014. ↑ Eranger, Steven; Kershner, Isabel (8 July 2014). "Israel and Hamas Trade Attacks as Tension Rises". The New York Times. Retrieved 13 November 2014. ↑ Heruti, Tali (2015-07-31). "Palestinian Infant Burned to Death in West Bank Arson Attack; IDF Blames 'Jewish Terror' - Israel". Haaretz. Retrieved 2016-06-10. 1 2 Heruti, Tali (2015-07-31). "EU, U.S. State Department Condemn 'Vicious' West Bank Arson Attack - Diplomacy and Defense". Haaretz. Retrieved 2016-06-10. ↑ "29 October 06: B'Tselem Urges the Security Forces to Prepare for the Olive Harvest". B'Tselem. 29 October 2006. ↑ Current olive harvest most violent in years, defense document reveals Haaretz 19 October 2010. ↑ "Israeli settlers accused of destroying Palestinian olive trees". Retrieved 28 July 2016. ↑ Barahona, Ana (2013). Bearing Witness - Eight weeks in Palestine. London: Metete. pp. 23, 26. ISBN 978-1-908099-02-0. ↑ Weiss, Efrat (16 June 2008). "Police: Leftists in Hebron more dangerous than right-wing counterparts". Ynetnews. 1 2 "Attacks on Israeli Civilians by Palestinians". Retrieved 28 July 2016. ↑ Sontag, Deborah (2 April 2001). "Israeli Baby's Funeral Becomes Focus of Settler Militancy". New York Times. Archived from the original on 14 November 2013. Retrieved 17 February 2009. ↑ Dudkevitch, Margot; Herb Keinon (5 May 2001). "Casualties of war". The Jerusalem Post. Retrieved 15 July 2008. ↑ "Rallies held around country in response to Itamar attacks". Retrieved 28 July 2016. ↑ Digest, World Jewish. "Fogel Family Murderers Arrested". Retrieved 28 July 2016. ↑ Bagshawe, Louise (24 March 2011). "A family slaughtered in Israel – doesn't the BBC care? – Telegraph". The Daily Telegraph. UK. Retrieved 16 April 2011. 1 2 3 4 Winder, Rob (6 July 2005). "Pollution politics in the West Bank". BBC. 1 2 Rinat, Zafrir (10 June 2005). "Settlement sewage kills off 200 olive trees grown by Palestinians". Haaretz. ↑ Ratner, David (4 April 2005). "Israel to dump 10,000 tons of garbage a month in the West Bank". Haaretz. ↑ "Israel/West Bank: Separate and Unequal." Human Rights Watch, 19 December 2010. ↑ Barahona, Ana (2013). Bearing Witness - Eight weeks in Palestine. London: Metete. pp. 96&106. ISBN 978-1-908099-02-0. ↑ Carroll, Rory. "Condoleezza Rice: send Palestinian refugees to South America." at The Guardian, 24 January 2011. ↑ Seth, Sushil P. "Israel sinks the peace process." Daily Times, 24 December 2010. Archived 28 January 2012 at the Wayback Machine. ↑ Nesher, Talila (8 June 2012). "The University Center of Samaria in the settlement of Ariel: More than a college, not quite a university". Haaretz. Retrieved 8 June 2012. ↑ "Shomron Regional Council Receives National Education Award". Israel National News. 22 February 2012. Retrieved 28 March 2012. The award is an expression of our respect and appreciation for local authorities that are outstanding in the investment in education and in the importance they attach to fostering the local educational system. ↑ מועצה אזורית שומרון זכתה בפרס החינוך (in Hebrew). Ma'ariv. 21 February 2012. Retrieved 28 March 2012. ↑ Bowen, Stephen (28 October 1997). "Human Rights, Self-Determination and Political Change in the Occupied Palestinian Territories". Martinus Nijhoff Publishers. Retrieved 28 July 2016 – via Google Books. ↑ "Imposing Middle East Peace". Retrieved 28 July 2016 – via The Nation. ↑ "Israel confirms settlement growth". BBC News. 21 March 2005. Retrieved 5 May 2010. ↑ "Gaza diary: Hakeem Abu Samra". BBC News. 12 August 2005. Retrieved 5 May 2010. ↑ Israeli Settlements and International Law, Israel Foreign Ministry website, 4 May 2001. Retrieved 11 July 2007. ↑ "Occupied Territories" to "Disputed Territories" by Dore Gold, Jerusalem Center for Public Affairs, 16 January 2002. Retrieved 29 September 2005. ↑ Diplomatic and Legal Aspects of the Settlement Issue, Jeffrey Helmreich, Institute for Contemporary Affairs, jcpa.org. Retrieved 11 July 2007. ↑ Kessler, Glenn (5 January 2006). "Bush at Risk of Losing Closest Mideast Ally". The Washington Post. Retrieved 5 May 2010. ↑ "Israel 'to keep some settlements'". BBC News. 12 April 2005. Retrieved 5 May 2010. ↑ ""What Happened to Secure Borders for Israel? The U.S., Israel, and the Strategic Jordan Valley" by Dore Gold". Retrieved 28 July 2016. ↑ Dromi, Shai M. (2014). "Uneasy Settlements: Reparation Politics and the Meanings of Money in the Israeli Withdrawal from Gaza". Sociological Inquiry. 48 (1). doi:10.1111/soin.12028. ↑ "US will accept Israel settlements". BBC News. 25 March 2005. ↑ Looters strip Gaza greenhouses, MSNBC.COM, Associated Press, 13 September 2005. ↑ Freeman, Simon (12 September 2005). "Synagogues burn in Gaza". The Times. Retrieved 7 September 2010. 1 2 "A Cup of Tea in Old Jerusalem". Archived from the original on 6 October 1999. 1 2 "Interview: Israeli settler Avi Farhan". Archived from the original on 1 November 2005. Retrieved 12 November 2005. ↑ "PA official: U.S. Mideast peace offer convinced Palestinians to seek statehood at UN." DPA, 17 September 2011. ↑ "Germany Threatens To Halt Submarine Sale to Israel." SPIEGEL, 31 October 2011. ↑ "Ahead of the UNGA vote //'Germany abstaining at UN because Israel wouldn't budge on settlements'". Retrieved 28 July 2016. ↑ "Israel says will stick with settlement plan despite condemnation". 3 December 2012. Retrieved 28 July 2016 – via Reuters. ↑ Pike, John. "UN Chief Warns Israeli Settlements Would Be 'Fatal Blow'". Retrieved 28 July 2016. ↑ Rostow, Eugene. Bricks and stones: settling for leverage; Palestinian autonomy, The New Republic, 23 April 1990. ↑ 'US will accept Israel settlements', BBC News Online, 25 March 2005. ↑ 'UN Condemns Israeli settlements', BBC News Online, 14 April 2005. ↑ 'Obama Speech In Cairo: VIDEO, Full Text', The Huffington Post, 4 June 2009. 1 2 Mélanie Jacques, Armed Conflict and Displacement: The Protection of Refugees and Displaced Persons Under International Humanitarian Law, Cambridge University Press 2012 pp.96-97. ↑ Review of Dennis Ross book, BY RAY HANANIA, hanania.com, 16 August 2004. Retrieved 11 July 2007. ↑ Tony Blair press conference, 17 April 2004, incl. comments on compromising on settlements, UK Foreign office. Retrieved 12 July 2007. ↑ Pike, John. "PNA to ask UN to reestablish 1967 border with Israel if Mideast talks fail - ambassador". Retrieved 28 July 2016. ↑ "US may give Israel arms in exchange for concessions". Retrieved 28 July 2016. ↑ "Full Text: Netanyahu's Proposal for Palestinian-Israeli Peace (June 2009)" A Demilitarized Palestinian State With Limited Sovereignty by Pierre Tristam, About.com Guide. ↑ "Brazil President in West Bank: I dream of a free Palestine". Haaretz. 17 March 2010. Retrieved 15 April 2011. ↑ "Jordan and Syria call for Israeli withdrawal from all Arab lands". Retrieved 28 July 2016. ↑ "US asks Israel for 90-day settlement building moratorium". Retrieved 28 July 2016. ↑ Barak Ravid and Shlomo Shamir "U.S. criticizes PA bid to take settlement construction to UN." Haaretz, 24 December 2010. ↑ Charbonneau, Louis; Dunham, Will (18 February 2011). "U.S. vetoes U.N. draft condemning Israeli settlements". Reuters.com. Thomson Reuters. Retrieved 20 February 2011. ↑ Haaretz Service (18 February 2011). "Palestinian envoy: U.S. veto at UN 'encourages Israeli intransigence' on settlements". Haaretz.com. Haaretz Daily Newspaper Ltd. Retrieved 20 February 2011. 1 2 3 Staff writers (18 February 2011). "United States vetoes Security Council resolution on Israeli settlements". UN News Centre. United Nations. Retrieved 20 February 2011. ↑ Haaretz Service (20 February 2011). "Deputy FM: Anti-settlement vote proves UN is a 'rubber stamp' for Arab nations". Haaretz.com. Haaretz Daily Newspaper Ltd. Retrieved 20 February 2011. ↑ Heruti, Tali (2009-11-25). "Netanyahu Declares 10-month Settlement Freeze 'To Restart Peace Talks' - Haaretz - Israel News Haaretz.com". Haaretz. Retrieved 2016-06-10. ↑ Keinon, Herb (2011-09-26). "'We won't renew settlement freeze to lure Palestinian Authority to talks' - Diplomacy & Politics - Jerusalem Post". Jpost.com. Retrieved 2016-06-10. ↑ 'Israel's UN envoy says only peace can halt settlements,' AFP/Ynet 17 Oct 2010. ↑ ABU TOAMEH, KHALED. "Abbas: Land swap principle reached". Jerusalem Post. ↑ "The European Union: Challenges for Israeli Diplomacy". Retrieved 28 July 2016. ↑ "Let them stay in Palestine". Retrieved 28 July 2016. ↑ "PA: Settlers can become Palestinian citizens". Retrieved 28 July 2016. ↑ Heruti, Tali (2011-06-19). "Cabinet Votes to Curtail Barak's Power to Veto West Bank Settlement Construction". Haaretz. Retrieved 2016-06-10. ↑ Netanyahu would let West Bank settlements expand. By Mark Levie. Yahoo! News. Published 26 January 2009. ↑ Peace Now, 1 August 2012 The Government Secretly Approved another Outpost: Nofei Nehemia. ↑ "Israel to build more West Bank homes". Al Jazeera. 7 June 2012. Retrieved 7 June 2012.